Close to the best vacation in a long time!! The members of your staff were very courteous and friendly and so helpful. Everything was exactly as pictured on the website and the location was perfect. We will definitely be back in the future. We have stayed at the Summerwind Resort for the last three years. They are always there for you and are happy to do whatever it takes to make your vacation a pleasant one! The condos are always very clean and tastefully done. Staff is very friendly and ready to assist you. Can't beat the price! Love the location! It's like the sign to the Santa Rosa Sound says, "Florida's best kept secret"
We were worried that the condo would not be ready because of the unusual check in times from 3:00 to 5:00. Most beach rentals have a specific check in time NOT a range. We arrived a little after 3:00 and the unit was ready. The staff were very polite and accommodating. The information they provided prior to arrival and during check-in made it easy for us to find and enjoy our stay. We felt the property we stayed at was very well kept, well stocked and very comfortable. We were sad to leave! We look forward to using Navarre Properties again in the near future and have every confidence we will enjoy a another great vacation! Everything was perfect! We loved it!! We felt right at home and the view was gorgeous. I didn't want to leave. We will definitely be back. Stay was amazing...have told anybody who asked about Navarre Beach and summer wind resort. We loved it and have already started looking at dates for another visit!!! 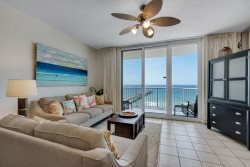 Very family friendly and easy access to the beach & bathrooms! Definitely will be back! Great place. Felt safe and secure!